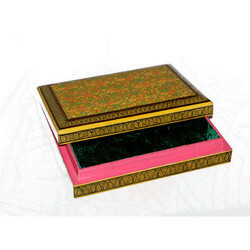 Fine Decorative Paper Mache Box Available In Different Designs & Sizes. Hand Painted Paper mache Flat box. 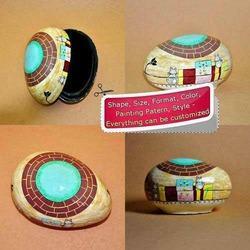 Sizes available: 9" x 6" , 10" x 7"
Paper Mache Mango Box made up of paper. The size of this box is 5 inches and can be given to the buyers for different sizes and rates according to the sizes. This can be used for the multipurpose like putting jewelry rings, chains etc. This elegant Hand-crafted jewellery box comes in different colours and shapes, and can be used to keep jewellery/ trinkets or simply used to decorate your home or office. Beautifully coloured papier mache boxes for all occassions..
We are considered as one of the reputed suppliers, retailers and exporters of Paper Mache Boxes which features Kashmiri craft. The offered products are sourced from trusted vendors and are made in a mould, then painted and polished to make intricate design. Moreover, these are available at market leading prices for the clients. Paper Mache is a very delicate art form which requires a lot of time and hard work by the crafts man. This tissue box is a beautiful example of it. It is metal based and can be used in car, home and office. A perfect thing to keep jewellery in. This papier machie box "A thousand flowers" design. One of the best art designs. Real gold outlinings. We offer Paper Mache Bangle Box to the clients. Paper Mache Bangle Box is meant for keeping Bangles. In Paper Mache Bangle Box, bangles can b e kept in safe manner. Paper Mache Bangle Box is available in multiple designs.